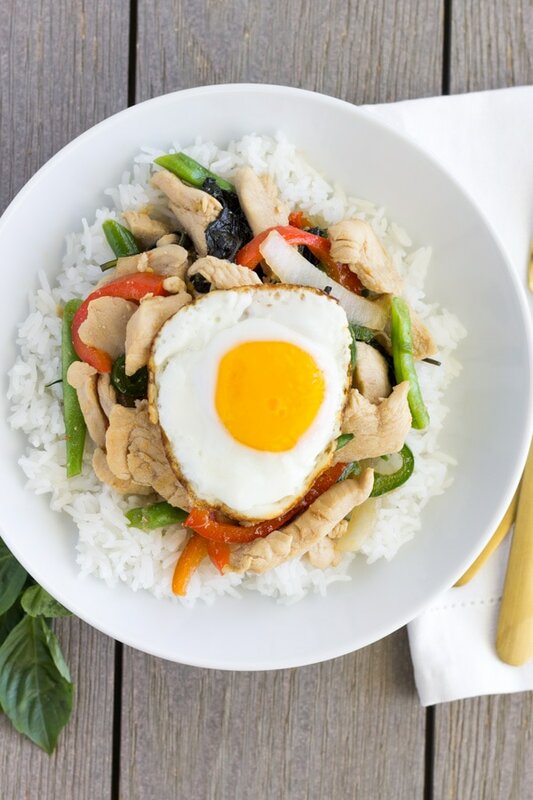 Pad Kra Pao Gai is a spicy stir fry made with Thai basil. This version is not as authentic, but similar to the basil dishes you’ll find at your local Thai restaurant. 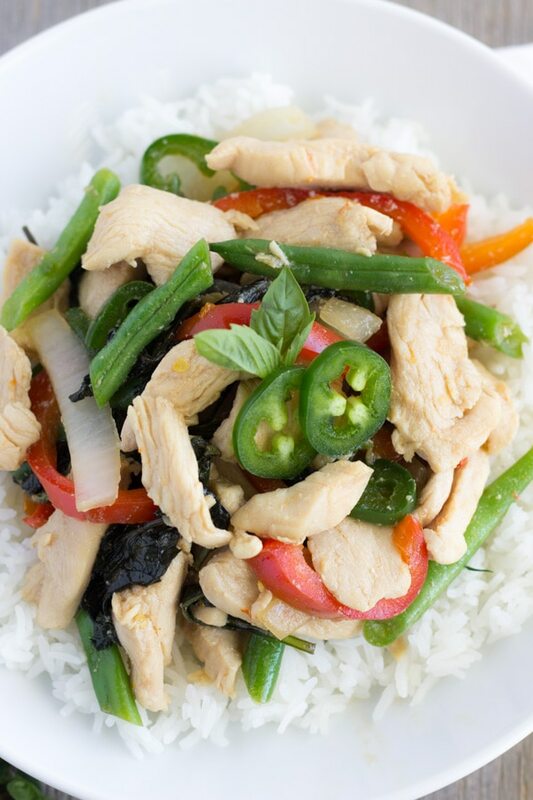 Any time we order Thai food, we always get the Spicy Basil Chicken, and this recipe is pretty close to it. Authentic Pad Kra Pao uses Thai Holy Basil, but it’s difficult to find. Thai Basil is sold in most Asian stores, try to use this one instead of Italian basil. 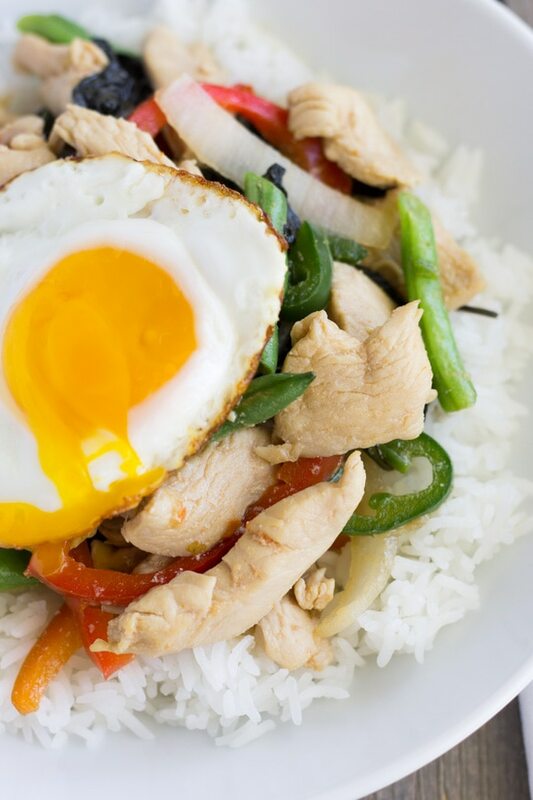 In Thailand, you’ll find this dish served with a fried egg on top. Since Pad Kra Pao is usually made very spicy, the egg helps bring down the heat. To fry the egg use a non stick pan with some oil to get the egg nice and crispy. I’ve even had this dish for breakfast sometimes! If you don’t prefer spicy food, then start with just one chili pepper since the basil in the dish will make it spicier. Begin by thinly slice the chicken breast and marinate in 1 tsp of Golden Mountain Soy Sauce. Then pound Thai chili’s and garlic in a mortar. If you don’t have one, a food processor will do, or you can finely chop them. Saute in a tablespoon of oil in a wok over medium high heat for about 20 seconds, then add chicken breast and cook thoroughly. Add onions, bell pepper, green beans, jalapeno, and soy sauce mixture. Cook for a couple minutes, then turn off the heat and add Thai Basil. Give it a good stir and its ready to serve. Thinly slice the chicken breast and marinate in 1 tsp of Golden Mountain Soy Sauce. Pound Thai chili's and garlic in a mortar. If you don't have one, a food processor will work, or you can finely chop them. Saute chili's and garlic in a tablespoon of oil in a wok over medium high heat for about 20 seconds, then add chicken breast and cook thoroughly. Add onions, bell pepper, green beans, and soy sauce mixture. Cook for a couple minutes, then turn off the heat and add Thai Basil. Give it a good stir and its ready to serve. For each serving top with a crispy egg that's slightly runny and rice.